Would railbiking be on topic? Would questions about railbiking be considered on topic on the main site? 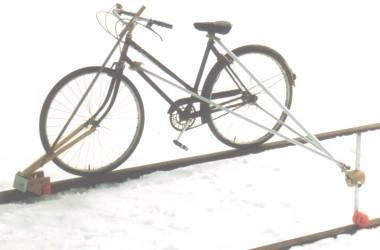 Railbikes are normal bikes that are temporarily modified to be use on abandoned railway lines, many of which go great distances into forested areas as well as other places such as dunes, etc. 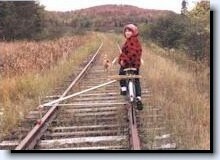 I think questions about both the activity of railbiking, and the bikes necessary to do the activity, would be on topic. Railbiking certainly falls into the site definition. In fact, we already have a biking tag, which is for "questions concerning outdoor activities that include the use of a bicycle." 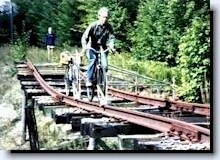 I've never heard of railbiking, so I Googled it, and it looks like a great way to get around, see the world, spend time with friends and family, and just enjoy being outside. Railriding organizations exist all over the world, so the subject would fit in nicely with our international user base. I wouldn't be surprised if some of the people here are already doing it, but just haven't asked questions. If not, there are probably people who'd be as excited as I would to learn something new. I think the bicycles needed to participate fall into the same category of equipment/gear used for many of our other activities. It may be especially true in this case, because these bikes appear to be custom-designed apparatus, not like any bikes we're used to seeing. People reading questions about railbiking would automatically be interested in the bikes themselves, and having to go to another site to learn about them might be more difficult and less fun. As with many SE sites, there is overlap between our site and others. My view is that as long as something is on-topic here, we can ask it here. If you don't get the answers you need, or if there's better information for you at the dedicated bicycles site, that's up to you. However, I don't see any reason not to ask about the bicycles here. In fact, it makes perfect sense that you would. This is of course just my opinion. Our community speaks for itself by voting and commenting, which is how it should be in the SE system! Be aware as evidenced in both of the linked questions there are questions of legalities, some of which brought forth some strong opinions. I think questions about these bikes would be more appropriate on bicycles.SE if the focus is on the bikes themselves. If it is more about the "outdoors aspects", then it should be ok here. Not the answer you're looking for? Browse other questions tagged discussion scope . Is asking the best / cheapest place to purchase something off topic? Is off-roading (4x4) on topic? Would questions about historic outdoorsmanship be on-topic here?